Dr. Tom O’Neal currently serves as the Associate Vice President of Research and Commercialization at the University of Central Florida (UCF), Vice President of the UCF Research Foundation, Executive Director of the UCF Business Incubation Program (UCFBIP) and Executive Director of the Florida Economic Gardening Institute (GrowFL). He has been part of UCF’s Office of Research and Commercialization team working to help UCF become a leading metropolitan research university since the year 2000. 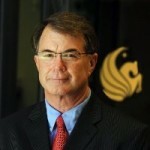 Tom has assisted in the formation of numerous spin-off companies for technologies developed at UCF. In 1999 he founded the UCF Technology Incubator of which he serves as the Founding Director. The UCF Business Incubation Program has expanded to 7 locations under his leadership. The Incubator was named the Incubator of the Year in 2004 and Incubator Network of the Year in 2013 by the National Business Incubation Association (NBIA) where he currently serves as Chair for the NBIA’s board of Directors. Dr. O’Neal has published papers and book chapters on the subjects of business incubation, entrepreneurship, and economic development and has received funding from the Kauffman Foundation, the NSF, the NCIIA, and others to support entrepreneurship and innovation initiatives. In 2011, he was asked to testify before the U.S. Senate Committee on Commerce, Science, and Transportation in Washington DC to share insight on his experience at UCF in creating industry partnerships and overall impact on economic development concerning the National Nanoscience Initiative.